At a special sitting of Ennis District Court, Judge Marie Keane remanded both Ken Mayers (82) Monte Alto Road, Santa Fe, New Mexico and Tarak Kauff (77) of Arnold Drive, Woodstock, New York in custody after refusing bail applications for both. Judge Keane refused bail after Inspector Tom Kennedy said that the State was objecting to bail for each accused. Kennedy expressed concerns that if both men were granted bail, the two accused will leave the State for the US and not be answerable to the charges before the court. Solicitor for the two Daragh Hassett said his clients assure him that they are “men of honour who have served in the US defence forces and will return to Ireland for their cases”. Kennedy said that the incident involving the two men at Shannon Airport held up airport operations for 45 minutes yesterday morning. 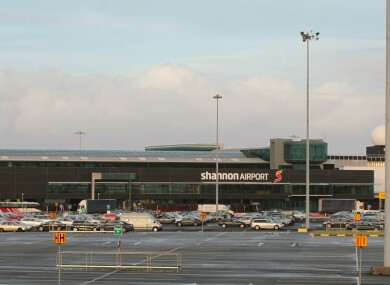 Kennedy said that there was a demonstration by anti-war activists taking place at Shannon yesterday. Refusing the two bail, Judge Keane said: “I have to take into account the two travelled to Ireland less than one week ago and have been apprehended relating to an alleged breach of security at an international airport. Airport security is hugely important and it affects each and every citizen who resides in this State or who visits this State. I am satisfied that I have to refuse bail based on the seriousness of the alleged offences before the court. Judge Keane said that she noted that the two men have exemplary records and are veterans of the US defence forces. The two men are likely to be held on remand at Limerick prison unless they can secure High Court bail before their cases are dealt with. In the case, the two are charged with causing €2,500 worth of criminal damage to the airport perimeter fence at Shannon Airport and unlawful trespass into a taxi-way at Shannon Airport yesterday. A small number of supporters – who later held banners outside court containing ‘anti-war’ slogans – were there to support the two men in court. Giving evidence of arrest, charge and caution, Garda Noel Carroll said that Kauff replied “not guilty” when charged and Mayers made no reply. Kennedy said that two arrived in Ireland last Wednesday and Garda Carroll said that the two were due to fly out of Dublin to the US on Wednesday. Garda Carroll said that it will be alleged that the two were spotted crossing a runway at Shannon on their way to inspect a military aircraft after 10am yesterday morning. Garda Carroll said that a cutter and gloves were found at a large hole in the airport security fence. Solicitor for the two, Daragh Hassett said that there is no evidence that the two were involved in cutting the fence. Hassett said that an alternative to allowing the two fly back to the US was that the two could reside with friends locally. He said that the two would give up their passports which would effectively ground them. Hassett said that similar cases have been going forward to the circuit court on indictment. Kennedy said that the State would be seeking a two month adjournment to allow the State get directions from the Director of Public Prosecutions (DPP). Judge Keane remanded the two in custody to appear via video link from prison at Ennis District Court on Wednesday. Email “82-year-old ex-US marine remanded in jail over alleged security breach at Shannon Airport”. Feedback on “82-year-old ex-US marine remanded in jail over alleged security breach at Shannon Airport”.